Unsound Finance gets to the heart of the issue. Looking back historically on early economic thought, the recurring issue that perplexed deep thinkers was how an economy that appeared robust could suddenly run so amuck. Economic busts would invariably focus analytical attention to “money,” debt and banking. Chinese officials are grappling with an epic Credit Bubble and the resulting greatest expansion of finance in history. This week saw further pressure on Chinese stocks and bonds. Last year’s measures to stabilize the country’s collapsing stock market, slow enormous capital flight and juice the faltering economy pushed China’s housing Bubble to ridiculous extremes. Chinese officials will now attempt to impose more strenuous measures to rein in financial excess without slowing the economy or bursting Bubbles. Global markets for the most part remain sanguine – not that they expect policymaker success but rather because they are confident that Beijing will not risk bursting Bubbles. Markets believe they have time. I have argued for a while now that EM Finance is Unsound. Over the past year, Chinese reflation coupled with global QE spurred a major short squeeze followed by on onslaught of (performance-chasing) EM inflows. As always, EM economies show alluring potential – so long as international inflows boost asset prices, lending and investment. To have EM binging again on dollar-denominated debt should be a troubling development for anyone paying attention. European periphery debt spreads narrowed this week. French to German 10-year yields collapsed 16 bps. Spanish bond spreads narrowed 11 bps, and Portuguese spread narrowed 26 bps. Notably, Italian spreads narrowed only 4 bps, remaining close to multi-year wides. European debt markets have evolved into huge Bubbles. How much speculative finance has shorted German bunds to fund higher-yielding bonds from Italy, Spain and Portugal? How large is the “carry trade” – short zero-yielding Japanese instruments to leverage in higher-yielding European periphery corporate and sovereign debt? My opening paragraph noted we live in the age of derivatives. To what extent these “carry trades,” and leveraged speculation more generally, are accomplished through derivative transactions is an important issue. Not only would such imbedded leverage create latent fragilities, it also creates transparency issues. There is ample evidence that huge amounts of finance have exited Europe, Japan, China and EM over recent years to participate in king dollar. Yet I believe such flows are not adequately reflected in Fed data. Could the explanation be that the proliferation of derivative strategies has distorted traditional flow data? This scenario could be viewed as positive for king dollar – and perhaps, to some, even favorable for U.S. securities markets and the American economy more generally. The perception is that U.S. finance is sound and the economy stable. I have serious doubts, believing deeply unsound finance has inflated a Bubble U.S. economy with latent fragilities. I would expect global “Risk Off” to illuminate enormous amounts of speculative leverage throughout U.S. securities markets, most notably in corporate Credit. I would not be surprised if global markets freeze up – a “flash crash” that would be more than a flash in the pan. Illiquid global markets would be perilous to derivative trades that rely on dynamic trading strategies to hedge portfolio exposures. This would curtail the cheap market “insurance” that has been instrumental in bolstering risk-taking throughout the securities markets. A resulting sharp tightening of financial conditions would expose the degree to which uneconomic enterprises have flourished in the almost nine years of free “money.” Corporate America would have huge exposure to a faltering global economy, with the major financial institutions all caught up in the global crisis of confidence in derivatives and counter-party issues. And there’s the issue of Trillions that have flowed into perceived highly liquid ETFs. Now that’s some Unsound Finance. It’s not difficult to present analysis showing 3% (why not 4 or 5%?) growth creating ample revenues to offset major tax cuts. But after eight years of egregious monetary stimulus, one can easily envisage a scenario where growth surprises to the downside. And it’s not a totally crazy notion to ponder growth faltering concurrent with a rise in Treasury borrowing costs. Such a scenario would likely see a bursting of assets Bubbles and a resulting collapse in revenues throughout the government sector. There’s as well all the entitlements and unfunded pension plans. When things turn sour globally, we’ll be spending a lot more on national defense. Unsound Finance always comes back to bite. The worrying part is that the world has never experienced anything comparable to the past 30 years. And it's going to remain one for decades to come. Sixty years after the Treaty of Rome, many view Europe as a spent force in global politics. Conventional wisdom states that world politics today is unipolar, with the United States as the sole superpower. Or perhaps it is multipolar, with China, India, and the rest rising to challenge Western powers. Either way, Europe’s role is secondary — and declining. The European Union, it is said, is too weak to avoid withering away in the face of Russian subversion, mass migration, right-wing revolt, British plans to leave, slow growth, and anemic defense spending. Of course, it’s easy to spot signs of disarray. Modern Europe is messy, and its institutions and policies are imperfect. Some of the threats facing the EU are real: slow growth and austerity, for instance, within the eurozone. Others, like rising right-wing nationalism and migration, are less so, for reasons I will discuss at the conclusion. Yet amid all the hyperbole and hysteria, a basic point gets missed. Europe today is a genuine superpower and will likely remain one for decades to come. By most objective measures, it either rivals or surpasses the United States and China in its ability to project a full spectrum of global military, economic, and soft power. Europe consistently deploys military troops within and beyond its immediate neighborhood. It manipulates economic power with a skill and success unmatched by any other country or region. And its ability to employ “soft power” to persuade other countries to change their behavior is unique. If a superpower is a political entity that can consistently project military, economic, and soft power transcontinentally with a reasonable chance of success, Europe surely qualifies. Its power, moreover, is likely to remain entrenched for at least another generation, regardless of the outcome of current European crises. In sum, Europe is the “invisible superpower” in contemporary world politics. Before turning to Europe’s specific military, economic, and soft power assets, let’s dismiss the nearly universal belief that Europe is too decentralized to act as a superpower. Europe is not a sovereign state. Yet in practice, it generally acts as a single force in world politics. Yet Russian President Vladimir Putin quickly discovered the futility of a Russian pivot to Asia. While the premise is, strictly speaking, true — China is Russia’s top trading partner — it accounts for only 14 percent of Russia’s trade. Just three European countries combined — Germany, Italy, and the Netherlands — account for more than 20 percent, and Europe as a whole for over half. No realistic increase in trade with China could offset European dominance. Treating Europe as disunited was geopolitically naive. Even though EU law imposes no legal obligation to implement sanctions, Europe acted — and paid more than 90 percent of the costs of the Western policy response to Russia. European power and unity are the glue that has held together this Western policy for the past two years. This is only one example of how, despite its fragmentation, Europe effectively projects power in those areas that count most for global influence. Certainly, European governments often disagree among themselves, sometimes vociferously and in public. Yet policy coordination, both formal and informal, permits European governments to act as a unit to influence the outside world. Three modes of European coordination are critical: common EU policies, coordination, and tacit policy convergence. First, EU member states often share a formal mandate to cooperate. Governments are generally obligated legally to act together in the name of the European Union on trade, regulatory, environmental, monetary, neighborhood policy, development, EU enlargement, the free movement of people, and border controls. When serious disagreements arise, countries often resolve them through constructive abstention, in which some governments set aside their own concerns and permit the EU to exercise its collective power in areas of greatest importance to others. Second, even when EU law does not formally mandate uniformity, European governments often form “coalitions of the willing.” After 60 years, Europe has entrenched a continental network of informal norms, procedures, and institutions that quietly encourage policy coordination. European foreign and defense policies illustrate how this system of voluntary solidarity works. Member states take foreign-policy positions in common, which can be implemented by the EU high representative and common diplomatic service, or by coalitions of national governments acting on their own. EU governments coordinate national positions in international organizations, including the United Nations. Not all governments need to participate for these actions to be successful. Again, constructive abstention permits governments to signal disagreement in principle with decisions that nonetheless go forward in practice — as occurred, for example, in recent decisions involving the former Yugoslavia and Libya, or recent efforts to dampen migration across the Mediterranean. This coordination extends to collective European military operations. While no formal mandate exists, missions often lack a formal EU imprimatur and involvement limited to those who wish to participate. Yet, in one form or another, European governments have launched dozens of joint military operations since the end of the Cold War. Impasses like the 2003 Iraq War, when European governments so strongly disagree that they pursue opposing policies on a prominent global issue, are extremely rare. Third, even when the EU neither mandates nor coordinates a policy response, the convergent national laws, strategies, and interests of European states more often than not generate compatible and mutually reinforcing policies. European governments have overlapping international institutional memberships and legal obligations. Almost all are NATO members, which means they conduct common planning and training and accept collective defense obligations. They adhere to the same treaties governing asylum, human rights, the environment, development, and many forms of U.N. cooperation. All are friendly with the United States. They share national embassies. In the soft-power realm, the ability of Europeans to educate foreign students, set global constitutional norms, and garner a worldwide following for athletic achievements contribute to a common European influence in the world — even if the EU explicitly coordinates little of it. At a more fundamental level, all European countries are democratic and economically interdependent, and they share largely uncontested (indeed, often invisible) borders. Hence they coexist without posing any mortal threat to one another. With the highly unlikely exception of a Russian attack on NATO, they face no such immediate security threats from other great powers, either. This relatively benign environment affords Europeans the luxury of focusing their geopolitical influence on other, more distant matters. This differs strikingly from the situation of, say, China, which must prepare for potential military conflict with almost all of its regional neighbors — Korea, Japan, Taiwan, India, Russia, Vietnam, the Philippines, and other South and Southeast Asian states, not to mention the United States — and keep its army in reserve to maintain domestic order. For these reasons, we should recognize Europe as a single superpower in projecting military, economic, or soft power — whether or not it acts formally as one. Let’s begin with “hard” military power. While Europe’s ability to project coercive force to compel others to acquiesce to political demands does not match that of the United States, it is more active and capable than any other global power. The oft-repeated phrase that “Americans are from Mars and Europeans are from Venus” is a great sound bite but a misleading policy analysis. The conventional starting point for measuring military capability is the money each country spends on defense. On this score, the United States, which accounts for more than 40 percent of global military spending, heads the list. After that, most analysts list China, with the second-highest national spending and more than 2 million active duty soldiers, followed by Russia, Saudi Arabia, the United Kingdom, India, Japan, France, Germany, and South Korea. Here again the failure to aggregate Europe clouds our geopolitical vision. If we unify European military activities, it comes in second. European military spending accounts for 15 to 16 percent of the global total. China runs third, with under 10 percent, and Russia spends less than 7 percent, less than half as much as Europe. At current growth rates, China’s annual military spending (or perhaps that of other rising powers) will not surpass that of Europe for at least a few decades, and the United States for one or two generations — even on the optimistic assumption that Chinese growth continues. To be sure, this isn’t quite a one-to-one comparison, since Europe’s militaries make their spending decisions separately. Some inefficiencies result when, say, France and Italy separately purchase and maintain their own aircraft carriers. Yet studies suggest that efficiency losses due to decentralized production and procurement — a problem that also bedevils the United States and China, with their domestic interservice rivalries and political pork-barreling — is much smaller than one might think. The most promising area for reform (consolidation of national defense industries) generates no more than 7 percent (about 14 billion euros) savings. This is real money, but too small a number to significantly alter Europe’s relative international standing. Moreover, the “bang for the buck” of the weapons Europe procures remains competitive, as evidenced by the fact that it consistently ranks as the world’s No. 1 arms exporter, outstripping even the United States and Russia. Yet even Europe’s advantage in annual defense spending understates the entrenched military advantages that it (like the United States) enjoys over any rising power. Usable military capability is not a simple function of defense spending in a given year, but investment in stocks of defense technology, materiel, training, and experience sustained over generations. The average age of equipment in the U.S. military varies from 10 to 25 years, and the life cycle of a fighter like the F-18, introduced just after the Vietnam War, will be nearly a century. For China to challenge Europe or the United States on an equal basis, Beijing would need to outspend the West not for one year, but for decades — something that delays the projected point where (at current trends) it would surpass the West close to the end of the 21st century. All scenarios whereby China (or another rising power) advances more quickly require increases in military spending of at least 15 percent per year. That in turn means that China must either triple its economic growth rate (unlikely) or increase military spending tenfold as a percentage of the gross domestic product (a strategy that, Chinese leaders are well aware, bankrupted the Soviet Union). A final reason for Euro-optimism is that Europe maintains enduring alliances. The United States and Europe are irrevocably — yes, even in the age of President Donald Trump, as recent reassuring words to NATO partners by Vice President Mike Pence and cabinet officers demonstrate — allied with one another and with 28 other NATO countries. This bloc commands almost 60 percent of global military spending. Europe, like the United States, maintains security partnerships and bases across the globe, as well as close relations with dozens of countries around the world. By contrast, Russia and China can call on few allies. Beijing offers modest military training and some assistance to Cambodia, Afghanistan, Tajikistan, Syria, and a few African countries; maintains a security partnership with Pakistan; and has only one ally: North Korea. These advantages are not just theoretical. European militaries actually do more in the world than those of any country except the United States. Only Europe and the United States have deployed tens of thousands of combat troops outside of home countries almost continuously since the end of the Cold War. During the past decade, European deployments have averaged 107,000 soldiers per year on land, plus a considerable naval presence. By contrast, China has deployed almost no combat soldiers abroad, and India has done so only within U.N. missions. Recent Russian activities have been limited to brief forays in neighboring parts of the former Soviet Union and air and naval support for its sole remaining Middle Eastern ally. Europeans do not just participate; they lead. They have headed military operations in Macedonia, Bosnia, the Democratic Republic of the Congo, Chad, Somalia, and Mali. They have led naval operations off the Horn of Africa and in the Mediterranean. They have conducted support or monitoring missions in Sudan, South Sudan, Guinea-Bissau, Libya, Indonesia, Iraq, Moldova, Kosovo, Georgia, Niger, the Palestinian territories, Ukraine, and the Baltic States. They have led U.N. missions, including in Lebanon. They have participated in a vital way to U.S.-led missions, including Iraq and Afghanistan. In the latter, more than 25 percent of the fatalities suffered by Western forces were Europeans from 23 countries. The world, and the burden on the United States, would be quite different without all this European activity. Despite their powerful military, many claim that Europeans could do more in the world if only their governments would spend more on defense — perhaps the 2 percent of the GDP that NATO leaders promised a few years ago. Yet little evidence suggests that more men and materiel — or greater centralization in EU institutions — would generate much more or better European military activity. While Europe did suffer the indignity of asking the United States to resupply it in Libya, it is difficult to see why, as many argue, the Europeans should develop more military capacity across the board. The need for resupply did not affect the outcome of Libya, and it is unlikely to do so elsewhere either, since the United States and Europe have agreed on every military intervention but one since the early 1990s. (The second Iraq War was a lonely exception.) One is hard-pressed to think of any recent case in which a significant group of European states (let alone a majority) desired to launch a strong military or diplomatic mission, but failed to do so for lack of military might. Europe possesses impressive military assets, yet the main drivers of its global influence lie elsewhere. Europeans tend to be skeptical about using military force in wars of choice, and have therefore chosen to specialize in nonmilitary tools of statecraft. Their capacities here often exceed those of the United States. Europe’s comparative advantage in civilian power is as vital to global peace and security as U.S. military might. To be sure, a century ago military might was widely viewed as the most essential of global power resources. Yet today it is rarely decisive. It is simply too expensive and uncertain, relative to the potential gains. No direct conflict has occurred among “great powers” since the Korean War. Smaller wars are also steadily becoming both less common and less costly. When they get involved, great powers tend to lose more than they win. Syria is troubling, but it is an exception to a much larger trend away from interstate war. Countries now typically find nonmilitary means to manage the most important global problems: not just territorial issues, but economic interdependence, development, environmental degradation, global health, human rights, migration, and even terrorism and crime. Among the most important nonmilitary capabilities is economic power. It is hard to see military power playing much of a role in dealing with most such problems. Though Europe maintains a robust military, it makes sense for it to specialize in a type of power that the United States cannot project. One European specialty is economic power projection. To induce political concessions, European countries manipulate access to their markets, condition economic assistance and exchange, and exploit regulatory and institutional dominance. Thus, a basic source of European economic power is the raw size of its economy. The conventional wisdom again misleads us. According to a recent poll of citizens in 40 countries, almost everyone in the world believes either that China is already the world’s dominant economy, or that the United States still maintains primacy. Only 5 percent think of the EU as a “leading economic power.” Yet those 5 percent have a point. By the simplest measure of economic power, nominal GDP, the EU is nearly the same size as the United States and 63 percent larger than China. This may surprise those who have read widespread reports that China now has the world’s largest GDP. Such analyses are deceptive because they employ “purchasing power parity” (PPP), a statistical measure developed by international development agencies to measure individual poverty and wealth in poorer economies where services and labor are cheap. PPP-based gross national product statistics deliberately inflate developing country income in ways that exaggerate the international value of exports and imports, high technology, modern weapons systems, foreign aid, and most other elements of international economic influence. The more appropriate standard for measuring a country’s aggregate economic clout is its nominal GDP. By this measure, China will not surpass the EU or the United States for decades. Recent newspaper headlines about the dominance of China and the United States are misleading because they, again, disaggregate Europe into 28 individual countries, rather than treating it as unified. The EU is, in fact, the world’s second-largest economy. Even more importantly, it is the world’s largest trader of goods and services. Since exports can be a source of vulnerability as well as strength, a more focused measure of trade power is dependence on foreign markets. The more trade dependent a country is, the less powerful it is. Europe is slightly more trade dependent than the United States but far less than China. What about recent increases in Chinese foreign direct investment that have triggered so much media attention? As it turns out, Europe remains the world’s leading foreign investor. To be sure, if you sell natural resources in sub-Saharan Africa, Latin America, or Australia, Chinese investment is a big deal. Otherwise, we should remember that most global investment still takes place among developed countries, where China’s role remains modest. Yet even this underestimates Europe, because effective economic power depends not just on the relative size of its economy but on average per capita income. The poorer its citizens, the fewer resources governments can extract from them. In poorer countries, development is often the primary imperative, foreign-policy spending a luxury, and the overall level of autonomous technological sophistication low. While the aggregate income of China ranks in the top three, its per capita income ranks 74th (between Saint Lucia and Gabon). Azar Gat, an Israeli scholar, estimates that developed governments like those in Europe extract three or four times as much for foreign-policy purposes as the governments of developing countries like China. One example is the ability to tax. Revenue as a percentage of GDP is almost twice as high in the EU as in China. Europe does not hesitate to exploit its preeminent economic position. EU enlargement —driven largely by perceptions of economic advantage — has been in recent decades the most cost-effective political tool of influence in the hands of any Western country. Over 60 years, the EU has expanded from six to 28 members, encouraging countries to adopt democratic, legal, and market reforms along the way. Though enlargement is now more difficult politically, it continues in the western Balkans. Other European economic instruments are less visible but no less important. One example is foreign aid. Europe provides 69 percent of global official development assistance (ODA), compared with 21 percent for the United States and far less for China. Europe, like the United States, offers the bulk of its total aid in the form of grants, whereas China tends to provide not ODA but export credits and government loans — financial flows that must be repaid and are thus less valuable to recipients. Yet even if you include both, Europe’s financial presence dominates that of the United States and China. European foreign aid has played a decisive role in promoting Western strategic objectives. For example, Europe’s 10 billion to 15 billion euros of annual economic aid and the promise of freer trade and energy arrangements constitute 90 percent of Western aid and trade with Ukraine. Ukraine remains troubled, yet without Europe’s economic commitment the government in Kiev would have surely gone bankrupt and fallen back into the Russian geopolitical sphere. Another example of a uniquely effective instrument of European economic power is the imposition of economic sanctions. Ukraine again illustrates the point. As with aid and trade policies, 90 percent of the cost of recent Western sanctions against Russia falls on Europe. This reflects Europe’s unique clout as the largest trading partner not just of many countries in the former Soviet Union, but nearly every country in the Middle East and Africa. It is hard to imagine sanctions working anywhere in the world without Europe’s active participation. The United States, by contrast, hardly trades with most of these countries, and thus it lacks the capacity to levy effective sanctions on its own. For example, Washington sanctioned Tehran continuously for 35 years with little effect. After Europe signed on to tough sanctions in 2013, Iran agreed to a nuclear deal within two years. “Soft power” measures the ability to advance foreign-policy goals by disseminating and manipulating ideas, information, and institutions that help persuade other countries to act in particular ways. Soft power is employed by various means, and the EU belongs among the world’s most effective manipulators of many of them. One important type of soft power is the construction of multilateral institutions that are attractive to join. Today, Europeans are the world’s leading supporters of global and regional institutions. Their commitment begins with the EU itself and its ring of agreements with regional neighbors, but Europe also has a decisive influence in managing economic interdependence, human rights, the environment, development, and health at a global level. Typical is the United Nations: Though the United States generally takes credit for being the largest contributor to the international body, once we aggregate Europe’s contribution, it is far more influential. Without European pressure, institutions like the International Criminal Court, the World Trade Organization, and other global institutions would not exist in their current form. By imposing conditionality in exchange for membership or collectively rewarding compliance, other governments become committed to institutional rules Europe has designed, thereby influencing the policies of individual states. Europe also employs subtler modes of exercising soft power. One is through education. Europe is one of the two educational superpowers. Twenty-seven of the world’s top 100 universities are in Europe, compared with 55 in the United States, one in Russia, and none in China. Europe exceeds the United States in educating foreign students, hosting almost twice as many students from outside the EU as non-Americans at U.S. universities, and over 10 times more students than non-Chinese studying in China. There are signs that opening up European institutions of higher learning to outsiders has been influential. For example, legal scholars have observed that the values and institutions found in most newly drafted national constitutions do not reflect American or Chinese practices, but distinctively European ones. These include social welfare rights, internationally recognized human rights, parliamentary government, and restrictions on money in politics. Beyond purely political values, Europe garners broad global admiration for its social, cultural, and lifestyle values. Among the top two dozen global tourist destinations, more than half are European. More profound is European dominance of almost all polls of global respect. Last year, for example, Forbes magazine asked 40,000 people worldwide which countries were the most “reputable”: a composite measure of happiness, cleanliness, lack of corruption, tolerance, and other qualities. Of the top 20 countries, 15 are European. By contrast, the United States ranks 28th and China 57th. Language? Here too, Europeans enjoy enduring advantages, since the world’s second languages are mostly European. English, of course, is a dominant second language across the globe, while French and Spanish also play important roles. The languages of other great powers, notably Mandarin and Russian, have quite limited sway. Even in Southeast Asia, Chinese ranks low as a second language, outside of diaspora Chinese communities. Pop culture? To be sure, the United States has one great advantage. Every one of the top 20 worldwide grossing films ever made came from Hollywood. Yet sports is a similar form of popular mass entertainment with comparable global cachet — and Europe is the world’s dominant sports superpower. Five of the top seven most-watched professional sports in the world — soccer, basketball, cricket, field hockey, table tennis, tennis, and volleyball — are played at the most prominent and intensive professional level in Europe rather than in the United States or China. The most prestigious European professional soccer generates more income and enjoys more worldwide visibility than any other sports franchises anywhere. European soccer grosses almost twice as much as the NFL and college football together in the United States. One also sees the breadth of Europe’s dominance of sports at the Olympics. In the Summer Games, Europe takes home more medals than the United States, Russia, and China together; in the Winter Games, Europe has always won more medals than the entire rest of the world combined. The underlying determinants of global influence — military capabilities, nominal and per capita income, trade and investment competitiveness, the intrinsic attractiveness of symbolic ideas and institutions — are changing far more slowly than headlines suggest. Europe today is the world’s invisible superpower — rivaling and, in many cases, surpassing the United States and China. It has the resources to retain this status for decades and generations to come. Today formal and tacit cooperation among European states functions so reliably that only in the rare cases that it fails to occur does the wider world take note. Europe, like other superpowers, is often distracted by seemingly intractable internal disputes and crises. Today they include migration, right-wing radicalism, Brexit, Russian resurgence, and slow growth under the euro. Yet these threats to the European project are less dire than they appear at first glance. Far-right parties are unlikely to triumph in any continental political system, let alone spark a mass withdrawal from the EU. In these political systems, government is by coalition and referendums are rare. In the Netherlands, euroskeptic parties are set to be excluded from government. In France, Marine Le Pen has little chance of prevailing in the decisive second round of the upcoming presidential election and her party sends only two representatives to the Assemblée Nationale. Euroskeptic parties rule Hungary and Poland, yet have shied away from the suicidal step of withdrawing from the EU. British leaders resolutely claim to be moving forward with a “hard Brexit.” However, Prime Minister Theresa May’s public negotiating plan proposes to retain (under another name) almost all existing types of cooperation with the EU except future free movement of people. (External trade policy remains in limbo, perhaps as a bargaining chip.) One important example is NATO. Britain intends to maintain its defense alliances, so there is little reason to expect its active participation in military “coalitions of the willing” to change. The migrant crisis is receding. EU and national policies have successfully reduced migration to a third of its 2015 peak. That would be impossible without leadership from Brussels, and a further round of common EU policies appears to be in the works. In Ukraine, where 10,000 people died in 18 months just a few years ago, a resolute Europe-led Western policy of aid, sanctions, military preparedness, and diplomatic engagement has helped reduce the death toll to a trickle. Whatever the outcome, these crises seem to have had surprisingly little impact on Europe’s status as a global superpower. Most of Europe’s core formal institutions — including the single market, environmental and other public regulation, the common trade policy, agricultural policy, foreign aid, common border controls — remain essentially untouched. They are not major targets of euroskeptic criticism. Other European superpower policies — including those in foreign, defense, anti-terrorism, anti-crime, foreign aid, sanctions, diplomatic, and development policies — require only informal coordination, “coalitions of the willing,” or tacit cooperation. Recent sanctions on Russia and Iran show that European governments are acting decisively even when diverted by crisis. All these policies will endure whether or not European governments reform their economies, further centralize or decentralize policymaking, increase defense spending, or adopt any other of the various policy prescriptions floating around Europe. We should not be distracted by sensationalist headlines. Sixty years ago, when European leaders met to sign the Treaty of Rome, one of their shared goals was to strengthen Europe’s global position. They have succeeded and, looking forward, there is little reason to doubt they will continue to do so. For over two years, Islamic State controlled the Iraqi city of Mosul, including its schools. Now that the U.S.-led coalition has pushed the Islamists out, the city's teachers face a dilemma: How do you reshape the minds of children who were taught to fight and kill? On a morning in late March, 20 children are standing between bombed houses and burned-out cars in front of an elementary school on a street in eastern Mosul. When you ask them what they learned inside, they talk about killing. Their teacher was Islamic State (IS), which had a stronghold here. "Daesh, Daesh," the children shout, using the Arabic pejorative for IS, with strong, excited voices, as if the sound concealed an unbelievable secret. The children are between the ages of 6 and 13. Their backpacks are too large for their bodies, they wear sandals and their T-shirts have holes. Some ate eggs that morning, others didn't. As the children wait for the gate to open, they call out and laugh. Their happiness is real, but if you look through it, you can see the war in their small, hardened faces. IS conquered Mosul in June 2014. When it tried to create a state, it didn't stop at acquiring land, people, a doctrine and a flag. It also pushed into every crevice of social life -- it controlled the economy, administered justice and created lesson plans that fit its views. The goal of IS was to create a worldview, which also led it to take over Mosul's schools. Iraqi army troops freed eastern Mosul a few short weeks ago. Since then, around 20,000 children have returned to school. Despite the danger of IS drone attacks and suicide bombers coming over the Tigris River from the contested western part of the city, 70 of the 400 schools in the east have reopened. Things are meant to be like they were before in their classrooms. But is that possible? What did the students here experience under IS? Abdel, 10, says: "In our math book there was a truck filled with weapons and a man from IS stood on it"
Basha, 13, says: "We sat around a lot and didn't do anything. Sometimes someone asked us who is better, the Iraqi army or IS? And we screamed loudly, 'IS'." Amir, 9, says: "The men made the animals disappear from our biology books. There were no more lions, only IS." Hassan, 12, says: "They threw a child from a high-rise. And they beat my uncle with a broken bottle until his stomach split open." Qaisar, 13, says: "They taught us how to decapitate a person. We practiced on a doll. The doll was a bit larger than me, in military clothes." It is 8 a.m., the teacher whistles, the children run into the Ben Marwan School, a yellow, low-rise building whose facade is pockmarked by bullet holes. The window above the entry gate is splintered, a mortar went through the roof in the rear, burst-apart desks are stacked in the classrooms. If one were to look down on the Ben Marwan School from above, one would see the scale of the devastation the U.S.-led coalition's air raids wrought on the streets around it at the start of the year. Houses that were known as IS control centers are burned out. Just a few months ago, IS followers decapitated four people in front of the school, their heads rolling before the chidren's very eyes. Now veiled women carry water from a tap to their houses, a boy sells sugar and others play soccer in a wasteland that might still be mined. The people moving around here walk carefully and are full of suspicion. Nobody knows what their neighbor is thinking, how many IS followers are hidden unrecognized in the houses. The war in eastern Mosul may have grown silent, but it is ongoing. For 18 months, Islamic State tried to shape the thoughts of the children in the Ben Marwan School. Its system called for a five-year elementary school education followed by four years of middle school. IS also had an Education Ministry: The so-called Diwan al-Taalim decided what Mosul's tens of thousands of teachers had to teach their students. In addition to indoctrinating them in the classroom, IS brought children into the mosques and assembled them on the streets to show them decapitation videos. "My school was a seed grain from which a megalomaniacal state was meant to grow," says the school's principal. Shaker Ahmad, 52, is a portly man with a white beard and rings under his eyes who likes to counteract the chaos with poetic bits of wisdom. Ahmad fought in the Iran-Iraq War and has been working as a teacher for over 25 years. He sits at his desk on the southeastern corner of the city. His four teachers are sitting engrossed around him on new sofas. "We burned the old ones at home to have heat in the winter," says Ahmad. "We also burned our shoes and books." How are they doing now, after IS? "Under IS we had around 100 students here," the principal says. "Most of them stayed at home." Now all of them are coming to school all at once. Ahmad has registered 800 children. He divides them into shifts -- most of them can only come two or three times per week. UNICEF sent him notebooks and materials, "Alhamdulillah ("praise be to God"), we are lucky, but it is not enough," he says. "For two years now, we haven't been getting our salaries from Baghdad," says one teacher. The Iraqi government stopped its payments to public employees in the occupied areas because they assumed the money would end up going to IS. "We worked under IS because we were afraid. Now we're working because we have hope for the future," says another. It's been almost three months since Shaker Ahmad reopened his school. When asked what they did after IS was officially driven out, the principal says, "We sang songs," for the first time in a long time. "We can smoke again, listen to music, use the telephone," he says as the nearby war thunders in the background. On this particular day, dozens of people will die when an IS mortar strikes next to the market in the city center and leaves a deep hole in the asphalt. In the west of the city, which is still held by IS followers, thousands of inhabitants are being used as human shields. Shaker Ahmad expected Islamic State's men to arrive after they overran Mosul in summer of 2014. He sat at home on the edge of the city because it was a school vacation. They ultimately came, three of them. An IS follower from Egypt and another from Jordan introduced themselves. They claimed to be with the "IS Education Ministry," supposedly headquartered in Raqqa, the terrorists' Syrian stronghold. They were accompanied by the future supervisor for the 30 schools in Ahmad's district in Mosul. The IS group let the principal know that they counted on his working with them. His teachers were to return to school. After IS made its round, their supervisor arrived in the Ben Marwan School. He seemed friendly. "You can continue under us as you had before," they say Abu Zainab, as they called him, told them. In the city, IS gave away bread and gasoline to the poor, and they gave children watches in the mosques. Nobody was suspicious at first. It took two or three months before the tone changed. One day, Abu Zainab came to the school with a sword. He had all the teachers sit on chairs and placed the sword in the center. He sat cross-legged on the stool and began his talk with verses from the Koran. He spoke about the role of IS for Islam and its responsibility to stand up against the West. He said the teachers now had a special importance in the "caliphate." "We are changing the lesson plans and the books," he allegedly said. He claimed the old books were full of blasphemy and that there would be further training for the teachers. "Those who resist will die." IS called on the teachers to burn the old books. They were books filled with poetry and songs, with stories about the wonders of Iraq, including the Epic of Gilgamesh, one of the oldest surviving works of classical literature. They threw it all into the fire. His people had apparently had thin new booklets printed in a paper factory in Mosul, Ahmad says. Other reports from Mosul claim that IS had given CDs to the students, so that they could print out the contents at their own cost. IS changed the geography in the books. It removed the border between Syria and Iraq, added together the population numbers to give the impression of a great empire. They depicted Kurds and Shiites as groups that opposed Islam and considered them to be "kafir" -- non-believers who were to be killed. Islamic State replaced history books with biographies of its leading figures. "We received biographies of Abu Bakr al-Baghdadi or the Prophet Mohammed," the principal remembers. Overall there was lots of religious literature that was partly based on writings from the 13th century. Even some of the teachers couldn't understand the Koran verses that all were supposed to memorize by heart. Terrified as they were, they followed the order. The apples and pears used to teach addition and subtraction disappeared from the math textbooks and were replaced with tanks and grenades. The plus symbol was replaced with the letter "z" because it too closely resembled a Christian cross. The students needed to calculate how many bombs an IS factory could produce in a certain amount of time. In English, one assignment was: "How do I ask someone if they can clean my weapon?" Art and music were abolished by IS because they weren't useful for jihad. On top of the religious teachings, the children fought in military training. During class, the teachers needed to wear their pants so that their ankles were uncovered, then they fastened rubber bands over their socks. Female teachers were required to veil themselves completely. And the rules also specified: No cosmetics, no perfume, no mobile phones, no cigarettes. Boys and girls were separated; male and female teachers couldn't meet under any circumstance. "They accused my predecessor of having sat next to a woman in the school," the principal says quietly. "IS killed him. And only then did I get promoted." Any father who accidentally brought a girl to a boy's school was killed. IS created a reign of terror and a minefield for the teachers. "We needed to think like them every step we took," says the principal. "We got better at it, but it also made us crazy." To save at least a few old books, one teacher hid them in his house next to the fireplace. If an IS member was to see it, he would have claimed that the books were there for heating. IS merged several schools in Mosul because hundreds of parents pulled their children out and no longer allowed them to attend. But home schooling was "haram," or banned. The rules in the Ben Marwan School became increasingly absurd. "Sometimes we would have liked to have laughed," says one teacher. "But they would have killed us immediately." In the entrance hall of the school, right next to the principal's room, figures of children are drawn on the wall. One child is bent over a book and reading. Two others are holding hands, under the word "welcome," a simple gesture, full of warmth. When IS took over Ben Marwan School, it painted over the children's faces with dark paint. It was considered "haram" to depict faces. The IS members also went to the butcher who sold meat in front of the school and who advertised himself with a poster of a cow. They spray painted over the cow and told the man that only God can create living creatures. Now this period is over and the principal says: "What becomes of this country is up to us teachers." But he hasn't yet figured out how to tackle this project. What he sees concerns him. "When the children play during the break, they play police and IS. One of them shoots at the other ones." Shaker Ahmad would prefer to simply forget the past. He has no plan for processing the events, no understanding of trauma, but he does have a heart, open eyes and a piece of wisdom: "Small children are like bread dough," he says. "You can shape them. They learn quickly, but they forget too." They are sentences that everybody here believes. Ben Warman School is rectangular, and in its right wing a door to one of the classrooms is open, with about 50 first-grade students crowded into the desks. The air in the room is stuffy. Muhammad Assil, who once studied theater at the university in Mosul, is teaching Arabic this morning. He has his pupils write out new words -- chick, apple, pear -- and then checks them. Assil is 29 years old. He has soft brown eyes, three daughters, a wife and wears a jacket. Normally his monthly wage is the equivalent of 160 euros. "Because the government doesn't pay my salary, I still work at my kiosk in the evenings." He says the period under IS control was the toughest of his life. "Life had become so expensive, that I wanted to teach to feed my family. IS didn't pay though," he says. But staying at home was too dangerous. Assil was born in Mosul, and was tortured twice. One time by the Iraqi secret service, after the fall of Saddam, when they supposedly confused him with a murderer. And once by IS, because he had taken selfies as he swam in a river half-naked. Assil doesn't know a life without violence. "We never spoke to the children about IS," he says. The main reason, he says, was that the parents of most of the children were themselves IS followers. "We could never be certain what they said at home. And now we still need to be careful, because IS has only been defeated militarily." Assil's colleague Ekhlas Hamdi, the only woman working at the school, still wears a full veil. Assil makes jokes about her and says, "You look like you're from IS." Then Hamdi answers, "The air here is dusty." Later she says: "I'm afraid. But it is OK, the children are used to the veil." Her voice trembles when she speaks, her look so intense and injured that one seems to see her past suffering in them. Assil says he knows one student who wets his bed. The parents, he says, had approached him and asked him to speak to their son. "I told him that he should use a toilet," says Assil, "and that a person doesn't do that." Then he looked at the floor for a long time, as if he had also been complicit in the legacy of IS. But he fled from the fighting in Mosul himself, running through the hail of bullets with his wife and two daughters. They lost a third and didn't track the daughter down again until that evening. "I try to be a role model for the children," he says. "We don't talk about the past, but I read them stories they need for their lives." For example, the story of the hunter and the bird. It goes likes this: A hunter follows a bird through a forest. The bird hides and makes jokes about the hunter. The hunter only notices the bird because it is cursing so loudly and ultimately shoots it. It is a brutal story to read. But what is its moral? "If you say mean things, you are punished," Assil says, beaming. The violence in the story doesn't bother him. He believes that caring makes a difference, content less so. In the teacher's room, they have hung a pyramid on the wall made up of five components. On the bottom, it says, "basic needs," then "security," and "social life," then "personal needs" and then all the way up top, "self-realization." "All in all that leads to a good life," says Assil. But he doesn't seem to be totally sure if the pyramid is more of a taunt or an incentive in Mosul at the moment. Assil is nevertheless optimistic, and quotes the same wisdom as all the others in the school do, independently of one another: "Children are like bread dough. You can shape them. They learn quickly but also forget again." Is that true, Qaisar? Qaisar al-Kurdi comes out of a classroom, a cheerful boy who seems younger than his 13 years. This morning he was the one who most energetically talked about the time under IS. In the teacher's room, he sits shyly on the sofa, the teachers only hesitantly allow him to be interviewed. Qaisar likes Real Madrid and wants to become a doctor, for hearts. Does he want to talk about what happened here? The boy closes the curtains so that the other children can't look in. "IS came every day in order to teach us how to fight," he says. "They explained nothing to us, we just had to follow orders." Slowly, slowly, his voice becomes more eager. Soon he jumps up and points to where they hid behind car tires or walls built with sandbags during their combat training. Qaisar moves in the empty room like a dancer, punches at an invisible face on the floor, wrestles the air, punches, shows how they hung a belt around him with plastic bombs in it. "This is how I had to walk," he says, and strolls around the room with the heavy imaginary belt like an astronaut on the search for solid ground, his thumbs click through the air, looking for the trigger of the detonator. IS gave them lifesize plastic bodies that were fully dressed. They looked like real human beings and were larger than Qaisar. The boy says he had to cut the head off. Soon he got the hang of using the knife and he says that IS was satisfied with his work each time. Qaisar's facial expression is hard to read -- a mixture of fascination, awe and pure fear. After the lesson, Qaisar's father offers tea in a room, covered in mattresses, at the end of the street. "I almost lost my child to IS," says Mohammed al-Kurdi, a devout Muslim dressed in black who doesn't shake hands with women. "In the beginning, I let Qaisar go to school, because I wanted him to learn how to read. Only after a while did we notice that they were trying to brainwash him." After a few months, he says, Qaisar started going to the mosque. There, they tried to convince him to join IS. "Can I do that without asking my parents?" he says Qaisar asked. An IS follower apparently said "yes." And when Qaisar talked to his father anyways, it led his dad into a potentially deadly conflict. The IS follower came to him several times and tried to take his son with him. "I ultimately did things like them," says the father. "I brainwashed him in the other direction. Taught him the right Islam, forgiveness, trust, until he wanted to stay at home." It's unclear how he managed that. And he too says the sentences that everybody here believes. Sentences that unburden and are meant to bring hope: "Children are like bread dough. They learn quickly, but they also forget again." When the children walk back to the Ben Marwan School in the afternoon, the principal comes to the gate. "Turn around," he calls to them. In western Mosul, almost 200 people have died in a bombing attack by the U.S.-led coalition. The government has called for a period of official state mourning. The principal takes the keys and closes the gate for three days. NEW YORK – More than four decades ago, US National Security Adviser Henry Kissinger declared 1973 to be “The Year of Europe.” His aim was to highlight the need to modernize the Atlantic relationship and, more specifically, the need for America’s European allies to do more with the United States in the Middle East and against the Soviet Union in Europe. But of all the challenges confronting the EU, France’s upcoming presidential election holds the most significance for Europe’s future, and perhaps for that of the world. Polls indicate that any of the four candidates could emerge as the eventual winner. What makes this uncertainty different and truly consequential is that two of the four, National Front leader Marine Le Pen and far-left leader Jean-Luc Mélenchon, support policies far outside the French and European mainstream. If either wins the second-round run-off on May 7, it could mean the end of French membership in both the EU and NATO, raising existential questions for both organizations – and for all of Europe. Such scenarios were unimaginable until only recently. For decades, Europe has constituted the world’s most successful, stable, and predictable region, a place where history seemed to have all but ended. The goal of making the continent peaceful, whole, and free had largely been realized. The rationale behind Europe’s six-decade-long integration process – often called the “European project” – was always clear. Western Europe, and above all Germany and France, had to be unified to such a point that war, which had so often characterized the continent’s past, would become unthinkable. AS USUAL, the president’s first foreign trip is to the chancellery in Berlin. But the meeting with Angela Merkel does not go well. The two women instantly begin squabbling. Accused of breaking Europe’s rules on borders, Mrs Merkel fires back that her visitor has not done her homework: Germany has always acted lawfully. Fine, growls la présidente: if Mrs Merkel wants a war, she will get one. On her return to Paris the president orders the European Union flag removed from official buildings. 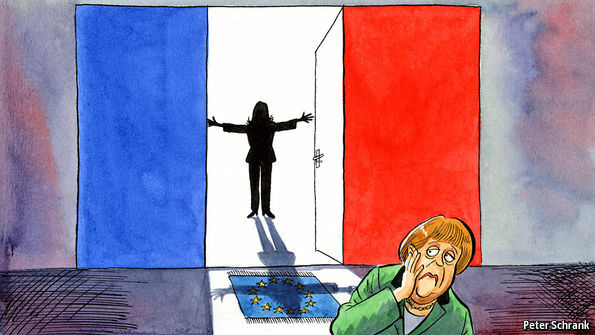 Soon afterwards she calls, and wins, a referendum on France’s exit from the euro. The streets stir, stockmarkets swoon and Europe reels. This cheerful tale, as depicted in “La Présidente” by François Durpaire and Farid Boudjellal, a graphic novel that imagines Marine Le Pen’s first months as president of France, is not one the rest of Europe wants to hear. The continent’s mood is just starting to brighten. Economies are picking up, and the Islamophobes lost in the Dutch election. Brexit, Europeans think, will be a disaster only for the British. True, the looming cloud in France is hard to ignore: the first round of France’s presidential election is on April 23rd, with a run-off two weeks later, and Ms Le Pen leads most first-round opinion polls. But few seem to have thought seriously about the prospect of her winning, and many dismiss the idea. They have half a point. Ms Le Pen is unlikely to become president; France’s two-round system inoculates against extremist parties like her National Front. Polls find her losing the run-off by wide margins against all potential challengers. But like the meteor that wiped out Tyrannosaurus Rex, her victory would be a low-probability, high-impact event. Ms Le Pen aims to withdraw France from the euro, the EU’s passport-free Schengen area, and possibly the EU itself. The EU can cope with small troublemakers like Hungary or Greece. But to lose a large founding member would throw its future into question. Betting markets rate her chances between 20-25%; the Eurasia Group, a consultancy, puts them at nearly 40%. These are not numbers that should let Europe sleep easy. The mechanism for leaving the euro, says Ludovic de Danne, Ms Le Pen’s Europe adviser, would be a referendum on exiting the EU altogether. But that faces constitutional barriers, as Ms Le Pen cannot win a majority in legislative elections in June. Moreover, the polarising effect of her election may not leave her much political wriggle-room. French voters have little appetite for a collapse in the value of their assets, or the chaos of capital controls à la grecque that a promised “Frexit” would bring. With markets roiling, French banks under pressure and protesters filling the streets, Ms Le Pen might prefer to park the issue. There are signs of this already; her rhetoric on the euro has cooled in recent weeks. Tackling migration and security might look more tempting. Unlike Frexit, tightening borders, limiting immigration and cracking down on foreign “posted” workers are popular propositions. Last year 71% of French voters told IFOP, a pollster, that they wanted to scrap Schengen. But that would create as many problems as it solves. Alain Lamassoure, a French former Europe minister, notes that there are around 1,500 border crossings between France and Belgium alone; it is ludicrous to expect them all to be policed. Full withdrawal from Schengen might also mean losing access to EU police databases, which would be an odd way for Ms Le Pen to provide the security she has promised voters. She might therefore simply tighten existing controls, stepping up checks at airports, railway stations and land crossings. Ms Le Pen would also target foreign-owned firms employing cheap workers from eastern Europe. (Rare is the French politician who declines to pick on Polish plumbers or Romanian labourers.) Taxpayer-funded positions would, says Mr de Danne, be subject to “national preference”: ie, French jobs for French workers. Much of this breaches EU rules, but so what? If Brussels wants to pick a fight, Ms Le Pen would be delighted to oblige. Ms Le Pen’s approach to the EU may be to denude it of authority by endlessly probing its tolerance. Her promises—income- and corporate-tax cuts, a lower retirement age, more welfare spending—will shatter the euro-zone’s budget-deficit limits. She promises a tax on imports, and monetary financing of state spending by the central bank. The European Commission, which has long tolerated mild French profligacy, would be faced with an acute dilemma. If it allows France to flout the rules, the glue that holds the EU together melts; why should other countries stick by their commitments? If it cracks down, it feeds Ms Le Pen’s narrative that Brussels is thwarting the sovereign will of French voters. Germany would be left even further adrift. The Franco-German alliance, as Mrs Merkel reminds Ms Le Pen in “La Présidente”, has always driven the EU forwards. But no German chancellor could do business with Ms Le Pen. In real life, her first sally abroad would be not to Berlin but to a summit in Brussels, where she would seek to renegotiate France’s EU membership. It hardly matters if that goes nowhere, for Ms Le Pen’s victory alone would deprive the EU of the oxygen of French support. At best, this would leave it at a standstill. More likely, it would atrophy into a loose club propped up by hollow institutions unable to help governments find solutions to common problems, from trade to migration to climate change. That, more than anything, is why the prospect of la présidente should keep Europeans up at night.